Hull City boosted their chances of avoiding relegation from the Premier League as Dame N'Doye scored both goals in a hard-earned win at Crystal Palace. N'Doye tapped home the first after Robbie Brady's effort was deflected into his path. 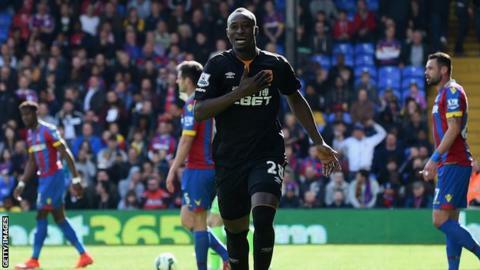 The Senegal forward had enough chances to claim a hat-trick as Palace slipped to a second straight home defeat. Palace's best chance fell to Glenn Murray but N'Doye sealed the points in the closing stages on the counter. After Lee Chung-yong gave the ball away, 30-year-old N'Doye kept his composure to fire past Julian Speroni, who had kept Palace in the game with a series of fine saves. Hull climb one place in the table to 16th, one point above the relegation zone. But with four of their remaining five games against Liverpool (home), Arsenal (home), Tottenham (away) and Manchester United (home), Tigers boss Steve Bruce and his players cannot relax. However, Bruce will take comfort from a committed, gutsy and determined performance as Hull ended a run of three straight defeats. It could all have been so different had 40-year-old Hull goalkeeper Steve Harper not saved well from Murray early in the game after the ball fell invitingly at the Palace striker's feet six yards out. This was a rare off-day from Alan Pardew's mid-table Palace. They were a shadow of the side that confidently dispatched reigning champions Manchester City earlier this month. Speroni produced fine saves to keep out N'Doye and Tom Huddlestone before the former broke the deadlock after 52 minutes from almost point-blank range after Brady had been denied. N'Doye, who joined from Lokomotiv Moscow in February, wasted another chance before Palace substitute Yaya Sanogo had a goal ruled out for a push. Hull substitute Liam Rosenior rattled the crossbar before N'Doye added the second in the dying moments to seal a rare away win for the Premier League strugglers. Crystal Palace manager Alan Pardew: "Key decisions went against us. The first goal was handball, we had a penalty with Wilf (Zaha), I think we had a penalty when Glenn (Murray) should have scored in the first half. And then our (disallowed) goal, I think that's a tough call. "We were poor today though, we weren't at it at all, and we'll address that in our way." Hull City manager Steve Bruce: "For me the reason why we're in the situation we are all comes down to taking your chances. We must have had five, six or seven when we could have gone two or even three-nil up. "Our inability to take them, in the Premier league, that's the difference. You don't create that many, and when you do create one, you've got to take it. "Thankfully today we've managed to take one and that relieves the pressure." Match ends, Crystal Palace 0, Hull City 2. Second Half ends, Crystal Palace 0, Hull City 2. Goal! Crystal Palace 0, Hull City 2. Dame N'Doye (Hull City) right footed shot from the right side of the box to the bottom left corner. Assisted by Gastón Ramírez following a fast break. Attempt missed. Dwight Gayle (Crystal Palace) right footed shot from the centre of the box is high and wide to the left. Corner, Hull City. Conceded by Julian Speroni. Attempt saved. Dame N'Doye (Hull City) right footed shot from the centre of the box is saved in the top right corner. Assisted by Gastón Ramírez. Liam Rosenior (Hull City) hits the bar with a right footed shot from outside the box. Dame N'Doye (Hull City) wins a free kick on the right wing. Substitution, Hull City. Alex Bruce replaces Sone Aluko. Attempt missed. Ahmed Elmohamady (Hull City) right footed shot from the right side of the box misses to the left. Assisted by Dame N'Doye. Substitution, Hull City. Liam Rosenior replaces Robbie Brady. Yannick Bolasie (Crystal Palace) wins a free kick in the defensive half. Attempt missed. Tom Huddlestone (Hull City) right footed shot from outside the box is close, but misses to the left. Assisted by Sone Aluko. Attempt missed. Jason Puncheon (Crystal Palace) left footed shot from outside the box misses to the left. Assisted by Yannick Bolasie. Attempt blocked. Yaya Sanogo (Crystal Palace) right footed shot from the right side of the six yard box is blocked. Substitution, Hull City. Gastón Ramírez replaces Stephen Quinn. Substitution, Crystal Palace. Dwight Gayle replaces Wilfried Zaha. Dame N'Doye (Hull City) wins a free kick in the defensive half. Corner, Hull City. Conceded by Pape Souaré. Substitution, Crystal Palace. Lee Chung-yong replaces Mile Jedinak. Attempt missed. Jason Puncheon (Crystal Palace) left footed shot from outside the box misses to the right. Attempt missed. Tom Huddlestone (Hull City) right footed shot from outside the box is high and wide to the left. Assisted by James Chester. Offside, Crystal Palace. Damien Delaney tries a through ball, but Yaya Sanogo is caught offside. Substitution, Crystal Palace. Yaya Sanogo replaces Glenn Murray.